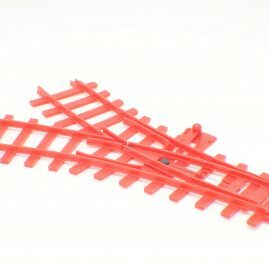 The Big Big Train track is made of very bright red plastic. It is flexible and rather strong. It will withstand stepping on and it can be used indoor and outdoor. The track sections can be joined by clipping them together, This is very easy but disassembling must be done with care because the fishplates can be damaged when the track twisted. The use of the stop-and-reverse switches makes it possible to lay track from point to point instead of a circle. With switches on either side set to reverse the locomotive the train would run back and forth. The track range was simple but efficient. There were long straights, long and short curves and hand operated y-points. Eight long curves make a full circle. The y-point and two short curves were also sold as a set. The picture below links to the track photo gallery. All items are from my collection.